The wrong footwear can lead to debil­i­tat­ing blis­ters and painful black toe­nails, while the right shoes (or boots) can help the miles pass quick­ly. The vari­ety of back­pack­ing footwear has increased dra­mat­i­cal­ly in the past decade, mean­ing it may be time to recon­sid­er how you dress your feet for the trail. Here’s a list of pop­u­lar footwear and some tips on how to choose what will work for you. PROS: Over-the-ankle hik­ing boots have long been the go-to footwear for back­pack­ing trips, with leather being the pre­ferred boot mate­r­i­al. Part of the appeal of a leather hik­ing boot is their dura­bil­i­ty; leather is both abra­sion-resis­tant and water-resis­tant mak­ing them last longer than oth­er mate­ri­als. Anoth­er fac­tor in the boot’s pop­u­lar­i­ty is height. Leather boots gen­er­al­ly pro­vide more ankle sup­port than oth­er footwear low­er­ing the risk of ankle injury in uneven ter­rain. CONS: While some peo­ple pre­fer the safe­ty pro­vid­ed by this bulk, oth­ers pre­fer a lighter shoe with thin­ner soles because it allows them feel where and how their foot is land­ing. Anoth­er down­side to leather hik­ing boots is their ten­den­cy to shrink as they dry. Because leather is water-resis­tant, boots that have been sub­mersed in water (maybe on a riv­er cross­ing or a long rainy day) don’t dry very quick­ly and when they do, they can shrink up to half a size. Leather is also dif­fi­cult to break in, so if you’re buy­ing boots right before a trip, be sure to have them stretched in the store. This soft­ens the leather and pre­vents hot spots that lead to blis­ters. Leather hik­ing boots are a ter­rif­ic option for new hik­ers, peo­ple who are car­ry­ing heavy loads, and indi­vid­u­als with weak ankles. They’re also great if they’re the shoe you love. Why change what’s work­ing? PROS: Pop­u­lar with long dis­tance hik­ers and peo­ple who run on trails (hence the name), trail run­ners dif­fer from run­ning shoes in their tread and sole. Trail run­ners have an aggres­sive tread and the sole usu­al­ly wraps over the front of the shoe, pro­tect­ing toes from get­ting stubbed. One obvi­ous ben­e­fit of a trail run­ner is the weight: these shoes are about half the weight of a hik­ing boot. Lift­ing less weight on each step can reduce the rel­a­tive weight of your load. A com­mon apho­rism is: a pound of weight on the foot is equal to five pounds in the pack. CONS: There are some down­sides to trail run­ners, the biggest being dura­bil­i­ty. These shoes will not last for thou­sands of miles; a descent pair will aver­age about five hun­dred miles, depend­ing on how lib­er­al you are with your def­i­n­i­tion of “destroyed.” Although some man­u­fac­tur­ers make water resis­tant trail run­ners, it doesn’t take much for these shoes to get wet. On the flip side, because they breathe bet­ter than leather, they don’t retain as much water and dry quick­er. For peo­ple with weak ankles or extra­or­di­nar­i­ly heavy packs, beware: the low­er pro­file of the trail run­ner doesn’t offer very much ankle sup­port. How­ev­er, if you’re tired of hot, heavy, hik­ing boots, pick up a pair of trail run­ners before your next back­pack­ing trip–the dif­fer­ence in weight and com­fort is notice­able. PROS: For the past few decades, approach shoes have been a sta­ple in the climb­ing world. But these grip­py-soled shoes are now grow­ing in preva­lence in the back­pack­ing com­mu­ni­ty. Approach shoes were devel­oped for use on long, semi-tech­ni­cal approach­es to climbs, hence the name. The body of these shoes are more like run­ning shoes than climb­ing shoes, because they need to be com­fort­able for long approach­es. The dif­fer­ence between this shoe and a trail run­ner is most appar­ent on the sole. Approach shoes are soled in the same rub­ber as climb­ing shoes, which makes them espe­cial­ly grip­py on rock. The sole extends above the toe box and usu­al­ly sur­rounds the back of the heel. CONS: If you intend to do some light climb­ing or boul­der­ing on your back­pack­ing trips, then you prob­a­bly already own approach shoes (or at least, you should). For back­pack­ing purists, con­sid­er buy­ing approach shoes if you’re look­ing for bet­ter trac­tion on rock and bet­ter pro­tec­tion around your toes and heels. 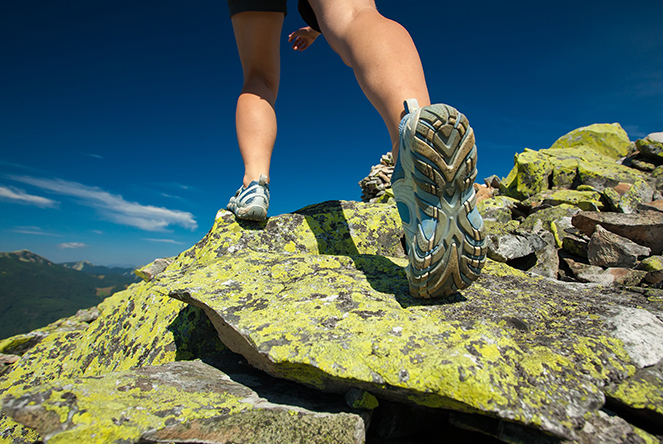 Like trail run­ners, approach shoes are not designed for longevi­ty if they’re used while back­pack­ing. Water can erode the mate­r­i­al of the shoe, while rocks and sticks take a toll on the stitch­ing. Be pre­pared to replace your shoes more often then you would replace boots. PROS: Devel­oped to mim­ic the free­dom of run­ning bare­foot, while still pro­vid­ing a mod­icum of pro­tec­tion from the rough ground, bare­foot shoes are a prod­uct of the run­ning com­mu­ni­ty. These shoes became vogue after reports sug­gest­ed that tra­di­tion­al shoes inhib­it the the foot’s nat­ur­al move­ment and can lead to an increase in injuries. While this argu­ment has been hot­ly con­test­ed, bare­foot shoes are now com­mon­place and may be the right option for some back­pack­ers. The shoes’ thin sole allows for greater con­nec­tiv­i­ty to the trail, but offers less pro­tec­tion against sharp rocks and sticks. CONS: There is no ankle sup­port in these shoes and they are not rec­om­mend­ed for hik­ers with heavy loads. But if you’re look­ing to cut back the weight of your footwear, noth­ing is lighter (unless you’re bare­foot). Because these shoes have indi­vid­ual toe slots rather than a toe box, they don’t work well for peo­ple with non-tra­di­tion­al toe lengths. For exam­ple, indi­vid­u­als with sec­ond toes that are longer than their big toe fre­quent­ly have a hard time find­ing bare­foot shoes that fit prop­er­ly. For ultra-light­weight hik­ers and vet­er­an back­pack­ers, bare­foot shoes may be the per­fect option because they’re light and they rev­o­lu­tion­ize the feel of walk­ing.